Der Artikel Hans Christian Lumbye (1810-1874): The Best of Lumbye wurde in den Warenkorb gelegt. Champagne Galop Nr. 1; Queen Louise Waltz; Copenhagen Steam Railway Galop; Dream Pictures; Salute to August Bournonville; Concert-Polka für 2 Violinen; Amelie Vals; Sounds from Kroll's Dance Hall; Petersborg Champagne Galop aus der Suite "Memories of St. Petersburg"; Britta Polka; Columbine Polka-Mazurka; Telegraph Galop; Hesperus; Finale-Galop aus "The Guardsmen of Amager"
Hans Christian Lumbye is today the internationally best known and most popular Danish composer of dances of the 19th Century. In 1843 when the now world-famous amusement park Tivoli opened its gates in Copenhagen, Lumbye acquired a permanent setting for his long and prolific composing and conducting career as the leader of the concert hall's orchestra. 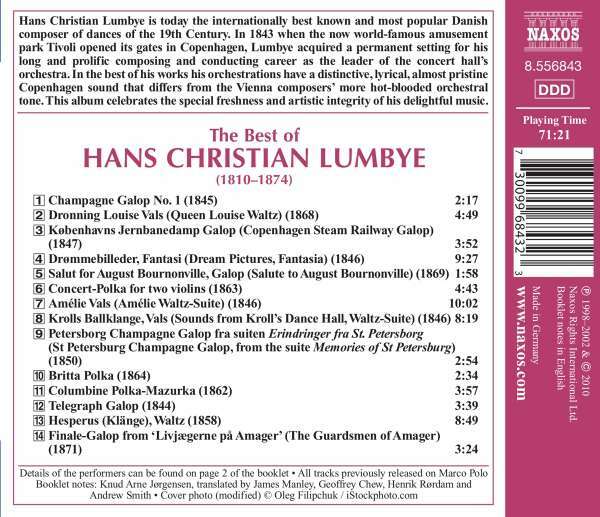 In the best of his works his orchestrations have a distinctive, lyrical, almost pristine Copenhagen sound that differs from the Vienna composers' more hot-blooded orchestral tone. This album celebrates the special freshness and artistic integrity of his delightful music.